You’ve got less than a week to turn that pile of odd-sized W-2’s, 1099’s, and paper receipts into an income tax return that won’t break the bank or get you audited. This April there are more free, cheap, online tools that can help you digitize your tax return and your financial records all year long. You (or your accountant) has been e-filing your tax return for years, but this year the options for doing your tax return from start to finish electronically are better than ever. You used to go to Staples and buy the latest copy of TurboTax on disc in a box (ha, disc!) and use your desktop copy of Quicken or Microsoft Money to track deductions and charitable donations throughout the year. Now you can do all that in the browser. TurboTax boxes and discs are still on sale at your local office supply store, as are copies of Quicken, but now you can just point your browser to TurboTax.com and get just as capable software without leaving the house. Several other online services can help you put off or get your return done. Buy more time and file for an extension online for around $20 at File Later. Generate 1099 and W-2 forms for contractors or employees on the cheap at FileTaxes.com. (Hats off to my book agent, whose 1099 I created at FileTaxes.com, for that pointer.) If you’ve already filed your return and are just waiting for your federal refund, check its status at good old IRS.gov. The cardboard shoebox of receipts from three years ago getting moldy in the garage will be impossible to track down if you ever get audited. 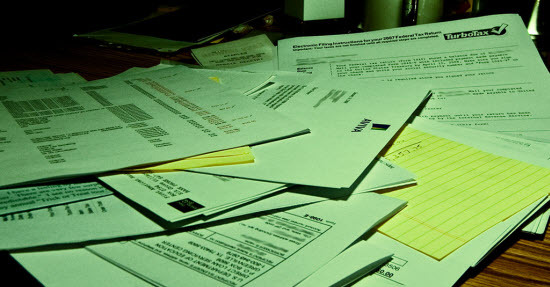 This year, invest in a document scanner that will turn your dead tree receipts into a searchable PDF. Any good scanner will do, but I really like the Fujitsu ScanSnap, a one-touch paper-to-PDF converter that’s actually fun to use. While keeping the original paper copies is a good idea, according to IRS.gov, “The IRS does not require you to keep your records in a particular way. Keep them in a manner that allows you and the IRS to determine your correct tax.” A good PDF scan of your receipts will do just that, and they’ll be at your fingertips on your hard drive. Once you commit to electronic record-keeping, of course, make sure you’ve got a great backup system for your computer–both local, to an external disk, and over the Internet, using a service like Carbonite, Mozy, or Amazon S3. Two other services which can help you capture and scan receipts to online storage easily are Shoeboxed, and all-around great capture tool, Evernote. In fact, the two services work together to help you capture and stow expense receipts for tax time. Freelancers and sole proprietors who have the pleasure of paying quarterly estimated taxes can stop scrambling for an envelope and postage stamp every three months. The EFTPS (Electronic Federal Tax Paying System) isn’t the most beautiful Web site you’ll ever use, but it lets you pay your estimated taxes without dealing with a single scrap of paper. No doubt your state also has an online estimated payment system; here in California I pay online at the Franchise Tax Board site. If you’re using Mint to budget and track your money during the year, you can use tags in addition to categories to mark off deductions like charitable donations or expenses. For example, if you take a client out to lunch, the expense will get categorized as “Restaurants,” but you can also assign as many tags as you’d like, like “tax deduction.” Come next April, just pull up the “tax deduction” tag list of transactions when you’ve got to itemize. What tools do you use at tax time? What’s your system for tracking paperwork? Let us know in the comments.